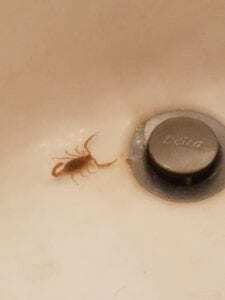 Scorpions are an ongoing problem for homeowners in the Phoenix and East Valley area so Convenient Termite and Pest Control recommends that after our initial scorpion pest control treatment in Mesa, you should also sign up for a pest management plan. By having regular pest treatments, we can keep your home free of scorpions as well as other pests that are often a food source for scorpions. 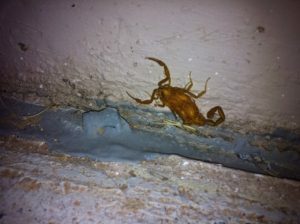 Our scorpion pest control products are placed in areas that scorpions harbor or hide. 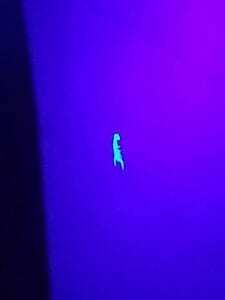 Scorpions have a hard, waxy cuticle for an exoskeleton. In order for the scorpions to get the pest control products underneath the hard outer shell, we use dusts called "desiccants". "Desiccants" are chalk with a chemical added to them. The chalk is like small pieces of glass that when walked over, cuts the outer shell of the scorpion. 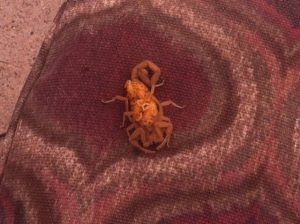 At this point, the chemical penetrates the inside of the scorpion's body, killing it. Some desiccants are waterproof and last from 8 to 12 months. Another type of product similar to a desiccant is called "Diatomaceous Earth" (D.E.). D.E. is made of finely ground fossils of fresh water organisms and marine life. This product cuts up the shell of the crawling pests and they dehydrate and die, usually within 48 hours of contact. 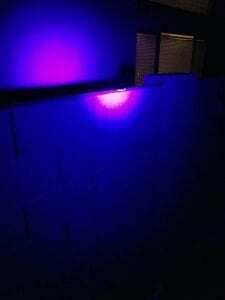 These dusts are put at all entry points to the structure, doorways, electrical lines, plumbing lines, weep holes for stucco walls (wall voids of 2"x4" frame). Dust is also applied to ground cable & water boxes, and fence pillars. Cabinet Voids - Holes are made underneath cabinets on the "kick plates.” These areas are never sprayed with general pest control products. Plumbing Lines - Dust is also applied in the structure near the plumbing lines. A small hole is made and dust is put in the wall void. Insects need moisture to survive and scorpions know where to find them. The interior and exterior of the structure is sprayed for pest control purposes, keeping the scorpion food source down. Our pest control services in Mesa, AZ are effective against species such as spiders, ants, silverfish, crickets, roaches, and other non-winged creatures. Fence lines and cement slabs are also sprayed with a residual product that lasts for 30 to 60 days. We re-spray the interior and exterior of the structure allowing for any new insects or scorpions to be infected with the residual chemical. Weather elements, landscaping irrigation or high traffic volumes may cause residuals to break down faster.  The structure will be inspected for any conditions conducive to infestation and we'll work as a team with the property owner to achieve complete satisfaction. 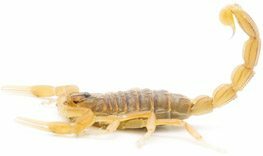 We guarantee our work as long as you stay on a scorpion pest control plan!